Home Fitness #1 Running and Weight Loss – How much Carbohydrates does a Runner need? Before I take any credit on this article, Remember my Facebook update about reading the book ‘Run to Lose’- A Complete Guide to Weight Loss for Runners compiled by Experts under Runner’s World. Going ahead and in this article I plan to use the knowledge of the experts at Runner’s World for the benefit of my blog readers. By no means is this information my concoction – however the experiences are definitely mine! I absolutely love the simplicity, clarity and functionality kept in mind by the experts. The running community trying to get back into shape can learn from this book endlessly! Going forward – I will use this book to give you some real good tips on weight loss for Runners! Will pick information that is hugely relevant for runners trying to lose weight! Why don’t many runners lose weight despite all the running? Because when they start running regularly they start consuming more carbs than their level of running really demands.A big bowl of pasta in the night before a long run is cool – however if you are trying to lose weight then you can’t have this every other day of your life just because tomorrow morning you have a run! I’ll cover Sugar and GI in the next article! Let’s focus on Carbohydrates, because this is your best weapon to combat Weight Loss! A runner needs carbohydrates like a car needs gas! Period! Heading out for a run with an empty tank – won’t take you far – even if you were trying to lose weight! You need to learn to run the right way – check this blog on Heart Rate Running to pull out the fat reserves from your body to build endurance. In isolation you cannot win the weight loss battle without understanding nutrition! Carbohydrates contain sugars that are turned into glucose in our blood and then stored in our muscles as glycogen. Glycogen and Glucose are the two forms of sugar that our body uses to store and use as energy. Glucose is the sugar your body converts into energy. Glycogen is the sugar your body stores in both your liver and muscle cells. Your body can’t use glycogen directly as a source of energy, and cannot store glucose. And yet again in very simple words – glycogen is what provides fuel to aerobic activities like running. When we run – our body first burns glucose (the immediate energy) – that is readily available in our muscle (this is what our energy gels and sports drinks are all about). As we run longer and add miles, it is then that our body starts to tap into our glycogen that has been stored in our muscle over the past few days. Why does a Runner need Carbohydrates? Runners (all fitness enthusiasts) need both glucose and glycogen for optimal performance. But if your focus is to lose weight first – then you have to learn to eat good carbs. Also need to remember that – For runners there sugar should come from carbs and not the refined sugar (the white sugar). But as mentioned above – Sugar will be a separate article! Sweet Potatoes – they are excellent for runners. Carbohydrates curb your hunger by keeping you satiated. If you keep craving for food, you WILL gain weight! You need carbs that contain generous amounts of fiber and Resistant Starch foods. They make you feel fill without making you fetch for snacks every hour. Carbs control Blood sugar – A spike in blood sugar is what you want to reduce if you are looking at saving yourself from both weight gain and diabetes. You want to focus on getting the highest –quality carbs with the most nutrients and the fewest unhealthy additives. Here is a detailed list of some excellent carbs for runners. Each serving contains approx 25 grams of carbs. Mixed Dishes (3/4 cup of tomato / daal soup, or 1 slice thin crust pizza, or 1 small vegetable roll). So these are some of the options that you can try. Your weight loss pretty much depends on the kind of carbs you are eating – processed and refined or unprocessed and unrefined. If you are not training for a race – then aim for 4.84 grams of carbohydrates per kg of your body weight per day.For eg. I am 46 kgs. 46X4.84 = 222.64 grams is what my carbohydrates requirement is on daily basis if I am not training and still trying to lose weight. If you are getting into the rigour of hard training – then you need to have 1 – 8.8 grams of carbohydrates per kg of your body weight. Remember – This is the amount of carbs you need to have everyday spread over the day. 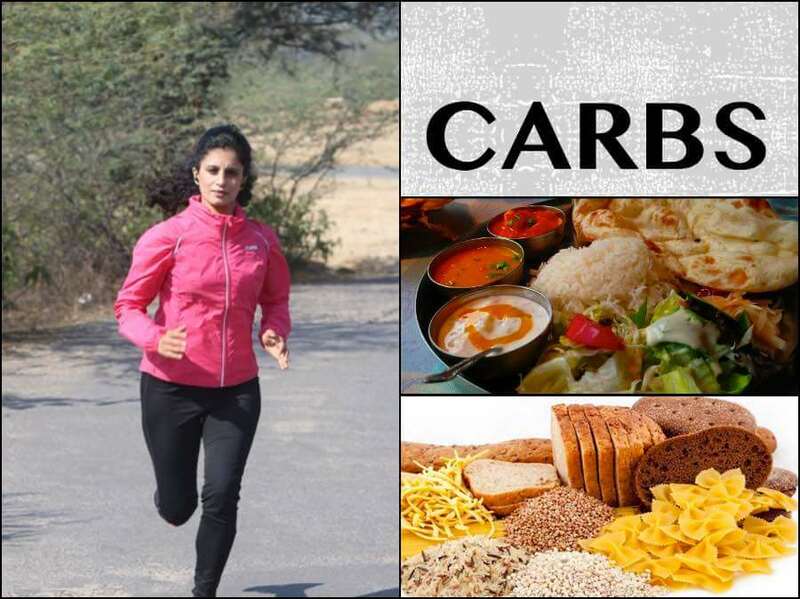 Ideally eat your carbs before and after the run too to avoid any fatigue. And since these are recommendations – you can increase your intake in case you are feeling very tired!When it comes to carbs – quality counts a lot. When it comes to weight loss – it does count a whole lot. Can u give your input on ketogebic diet for runners. Here the plus point wld be fat can give more kilocal as compared to carbs. No spike of insulin as gay is concerted to ketones and no chance of adding fat to adipose tissues. Thanks! Look fwd to the next two!